dance.net - scotland,livingston - powerstation (nightclub) breakin! (4492231) - Read article: Ballet, Jazz, Modern, Hip Hop, Tap, Irish, Disco, Twirling, Cheer: Photos, Chat, Games, Jobs, Events! 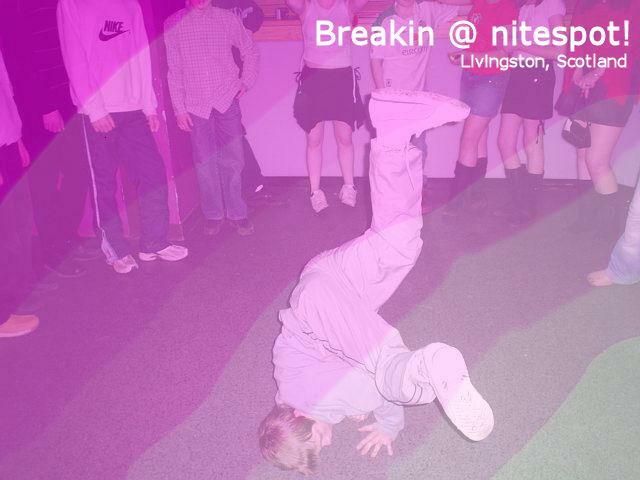 scotland,livingston - powerstation (nightclub) breakin! This picture was taken at my local nightclub called the powerstation, we have masive dance battles and breaking groups this is the best picture i had. this boy in the pic is only 10 and i think this is amazing cause i couldn't do it anyways. So let me know what you think. p.s i edited this picture.